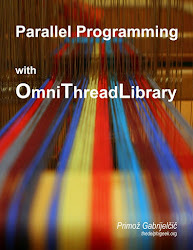 … when you can get “Parallel Programming with OmniThreadLibrary” and three “High-Level Multithreading with OmniThreadLibrary” for a reduced price! Go to https://leanpub.com/omnithreadlibrary and buy the “The Book + Webinars” package for mere $29.99! By the way, now you can buy a site-wide license – buy the book and give it to anybody in your organisation for mere $250! Plus you get all three webinars in the deal. I know some were waiting anxiously for this release so joke aside – we are sorry that we couldn’t release it in November but you know how it goes – there is always one more showstopper problem :( We know that this beta is not yet perfect (and we’ll release another one before the product is finalized) but as we do want your feedback we have exposed it for the public consumption. A list of changes since the last released version is available here. And remember – Smart targets everything from microcontrollers (Espruino) to mobile devices (in-browser, PhoneGap, Cordova), desktop (in-browser) to servers (NodeJS). This is a guest post, written by Anton Alisov, software PM and developer from Ivanovo city, Russia. I’m posting it here because I want to increase visibility of this new memory manager which featured quite well on my recent test (guest posted at Eric’s blog). I’m perfectly aware that my test was superficial and I intend to do a better test with more memory managers in the following weeks. Arnaud Buchez already posted a overview of the memory manager on his blog. And now I’ll give word to my colleague Anton. for production. So, we decided to develop our own memory manager to have more control over it. We believe, one doesn't have to be big to be efficient. Meet a new player - SapMM - Simple As Possible Memory Manager. the real power of SapMM shows in multihreaded applications. SapMM scales very well and in a vast majority of scenarios is much faster than FastMM in multithreaded use. Yellow – sessions I’d like to attend. Green – sessions I really want to attend. Red – sessions I have to attend. Can somebody please invent a time machine before November 14th? OmniThreadLibrary 3.03a has just been released. This is purely a bugfix release which fixes ugly problem in the ForEach abstraction. If the code has called ForEach with empty input set (for example, ForEach(0, –1)), the program would block infinitely. OTL 3.03a is available via SVN or as a ZIP archive. The ITDevCon conference is almost there (register while you still can!). As four times before, the organizer has invited an impressive list of speakers which will be giving 19 presentations (if I counted correctly), divided in three parallel tracks over two days. The conference will occur on 14th and 15th in the beautiful city of Verona. On the first day of the conference I’ll be presenting two Delphi-related sessions. In the Using attributes and RTTI to automate programming tasks talk, I’ll introduce a concept of attributes in Delphi and present few different practical uses for this interesting but underused language concept. In my second session of the day, Continuous Integration, delivery and deployment, I’ll talk about continuous integration and its cousins, continuous delivery and continuous deployment. In the session I’ll present few different software tools that support those concepts and I’ll also speak about practical experiences with continuous integration in the field. I hope I’ll see you in Verona so we can talk about Delphi, Pascal, and everything related and unrelated! Yesterday’s 3.03 version was somehow corrupted (in a way that it doesn’t compile). I have no idea what I did wrong as I did recompile test apps before committing and they did compile. Anyhow, if you’re one of the first 85 downloaders, please download the corrected version or implement a very simple fix. In the OtlParallel unit on the line 1663 a class prefix is missing. Just type it in and everything will work. EDIT 2013-10-16: It has been brought to my attention that both the original 3.03 and yesterday's fix were missing the XE5 packages. This has been now fixed. You can download missing packages from here. OmniThreadLibrary 3.03 has just been released. It is available via SVN or as a ZIP archive. 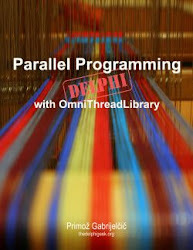 OmniThreadLibrary is simple to use threading library for Delphi. It's main "selling" points (besides the price, of course are power, simplicity, and openess. With just few lines of code, you can set up multiple threads, send messages between them, process Windows messages and more. OmniThreadLibrary doesn't limit you in any way - if it is not powerfull enough for you, you can ignore any part of its "smartness" and replace it with your own code. If you don't like working with threads - no problem! You can use high-level primitives like parallel for, futures and pipelines to introduce parallelism into your application. OmniThreadLibrary is an open source project. It lives in the Google Code and is licensed under the BSD license. support is limited to Windows targets. Firemonkey is currently not supported. Support for XE4 and XE5 (tnx to [Uwe Raabe]). TOmniMREW is automatically initialized to 0 when created. Input/Ouput collections of a specific stage. Added IOmniTaskControl.Stop - signals thread to stop and immediately returns. Added OtlSuperObject (tnx to [Lee_Nover]). Different thread pool can be specified for all OtlParallel operations via the new TaskConfig.ThreadPool function. Added IOmniLockManager<K> to the OtlSync unit. TOmniBaseBounded(Queue|Stack) internally aligns allocated memory to required CAS granularity (8 bytes on 32-bit platforms, 16 bytes on 64-bit platforms) (tnx to [Alexander Alexeev]). TOmniBaseBoundedQueue's ring buffers are internally aligned to 2*SizeOf(pointer) (tnx to [Alex Egorov]). Prevent memory leak if (Queue|Stack).Initialize is called more than once (tnx to [h.hasenack]). Fixed memory leaks in `forEach output` and `checkVat` examples(tnx to [Steve Maughan]). Simple pipeline stage handles exceptions in the executor function. Compiles when 'Typed @ operator' is enabled (tnx to [arioch]). Removed optimization which caused ForEach to behave differently on uniprocessor computers. 54_LockManager: Demonstrates the new lock manager (IOmniLockManager<K>). Sometimes you write a blog post that you wish you wouldn’t. Maybe you don’t, but I certainly did. Yesterday I wrote about TStreamAdapter.Seek Broken For Large Files I completely incorrectly stated that “the bug was not fixed in XE4/XE5”. The reason for my mistake was that although I verified the problem in the XE2, I didn’t write any test code for it (we already had a failing application so I didn’t have to – or so I thought) and I only checked the RTL for changes. I found out that the TStreamAdapter.Seek didn’t change from XE2 to XE4/5 and assumed the worst. Well, the good guys at Embarcadero did fix the problem in the meantime – but in a different place. They have added a new Seek overload to the TStream class and this new Seek (which is implemented as an inline function) acts as an intermediary between the TStreamAdapter and the correct TStream.Seek method. This solution is much better than our quick fix as it also fixes all other code in the world which mistakenly calls the wrong Seek overload. What have I learned today? That looking at the source code is not enough, especially if you want to complain. Always write a test case (and then run it!). I deeply apology to Embarcadero programmers (especially to the guy who fixed the original error) and to you, my readers. And now, if you’ll excuse me, I’ll pull a cover over my head and gently weep. EDIT I was completely wrong in my analysis and this bug was indeed fixed in XE4. I'm leaving the original (slightly edited) post below - firstly to remind myself to thoroughly test everything before posting and secondly to help some poor programmer who will run into the same problem with Delphi XE, XE2, XE3 ... in the future. Yesterday a colleague informed me that he added a workaround for a VCL bug (which we confirmed to exist in XE2, XE4 and XE5) to our codebase and asked me if I could “inform the authorities”, i.e. enter it into QualityCentral. Imagine my surprise when I not only found the bug already entered but marked as fixed! The problematic code is posted below, problem marked with a yellow color as it is hard to spot. TStream implements two Seek methods (below). The former is here for backwards compatibility and allows only seeking in 32-bit-addressable (i.e. smaller than 4 GB) files. The latter supports files larger than 4 GB. If you Ctrl+Click on ‘Seek’ in the TStreamAdapter.Seek implementation, IDE will jump to the latter Seek – which is incorrect as in reality the former (32-bit) seek is called. That makes the problem harder to spot. Embarcadero people – can somebody please reopen the original bug report? This is something that surely needs to be fixed. Our temporary (we’ll see for how many future Delphi versions) fix is the same as in the QC #105985 – make a copy of the TStreamAdapter.Seek and cast the dwOrigin parameter into TSeekOrigin enumeration so that the correct TStream.Seek method is called. If your XE5 installation doesn’t want to recognize attached Android phone when Windows see it perfectly well (and you have done all the groundwork including putting the phone into USB Debugging mode), check if you have installed USB drivers that support adb – the android debugger. Typically, the drivers that are installed automatically by Windows won’t work with the adb. This page links to correct drivers for various phone manufacturers. This StackOverflow topic may help you in case of hard-to-resolve problems. And, of course, read the official documentation on debugging on Android devices first! While I love the way Delphi is expanding to multiple platforms (but please, guys, stop the horses once in a while and fix some bugs! ), I think the Delphi language could use a facelift. In particular, I like what Eric is doing with the DWS and I absolutely enjoy coding in Smart Mobile Studio where I could use the full power of Eric’s improvements to the language. Another nice feature are property expressions – a way to write anonymous getters and setters. These are incredible time saver. If I redo this the Delphi way, I end up with a much longer code. When I have to write a multiline string constant, multiline strings come handy. Even better – DWS will ignore leading common indentation if string is introduced with #” (or #’). And last (but definitely not least), DWS implements a true conditional operator. I’ll be presenting the full XE5 development powers – developing for Windows, OS X, iOS and Android in Ljubljana, on September 18th. All three webinars are now available for download! For a mere $10 you’ll get a hour-long presentation of OmniThreadLibrary tools that will greatly simplify your multithreaded programming. A bundle of all three webinars is also available for mere $25: High-Level Multithreading. To download code samples and presentations, visit the OmniThreadLibrary webinars page. Internet is a fragile, fragile thing. Listeners to my webinars know that. Last time we got disconnected because of connection problems on my side. Sadly, we will not be able to finish the webinar today. I’m very very sorry for that. The code and slides for the Part I of the High-Level Multithreading webinar is available now at www.omnithreadlibrary.com/webinars.htm, as is the link to the downloadable video, which is being sold on Gumroad for $10. Part II of the webinar was rescheduled for July 3rd. It will be transmitted at 15:30 CET / 9:30 EDT / 6:30 PDT / 23:30 AEST. Register here. Even if you were registered for the interrupted webinar, you'll have to register again. If you are not yet registered for Part III yet (this Thursday at the same hour as rescheduled Part II), you can register here. Please keep in mind that all parts are independent – even if you missed part I, parts II and III will be completely understandable. I would like to apologize to everybody participating today for the technical difficulties. We had some storms in the area earlier before and they have affected internet connections more than I expected. We will repeat this webinar soon. I’ll post the new date here as soon as I know it. Register for the OmniThreadLibrary Webinars! Everything is set up and now you can register by clicking on the links below. Introduction to high-level abstractions, deeper look into Async/Await, Future and Join. Quick overview of high-level abstractions, deeper look into ParallelTask, BackgroundWorker and Fork/Join. Quick overview of high-level abstractions, deeper look into ForEach (parallel ‘for’) and Pipeline. Each part will last about an hour and will start at 15:30 CET / 9:30 EDT / 6:30 PDT / 23:30 AEST. Webinars will be available for the download. They will cost $10 each and bundles with reduced price will be available. Online webinars are free to attend. FireDAC/DataSnap was well visited in well accepted (and I also had a great time preparing it). Big thanks to everybody for attending! Materials (in Slovenian language) are available here. Link to the registration form will appear shortly on this blog. It will also be sent to participants of the survey. Next Wednesday (12th) I’ll be talking about modern data access technologies in RAD Studio XE4. Thanks to everybody for coming to the presentation! If you live in Slovenia and if you are programming in Delphi or C++Builder, make sure to reserve some time for the next Wednesday (22nd) for the RAD Studio XE4 presentation in Ljubljana. Most of the presentation will focus on the iOS development with RAD Studio XE4. More details here: Marand. For Mason (and everybody else who might be interested), here are condensed results of the OmniThreadLibrary Webinars Survey. Results of the OmniThreadLibrary Webinars Survey are now in. 77 people cared enough to answer (thanks!) and from them the Random.org site selected the winner who will get a free copy of the Parallel Programming with OmniThreadLibrary book – Mr. Nigel Hughes. Congratulations to the winner! Considering the results of the survey we have decided that the webinars will be free and that a copy of each webinar will be available for download for $10. First 20 downloads will also get a free copy of the OTL book, courtesy of De Novo software. Exact dates/times for webinars will be announced later this month. Stay tuned!